VIP - Celebrate World Spay Day with Humane Animal Rescue! Humane Animal Rescue presents the 8th Annual B*tches Ball to Celebrate World Spay Day! The B*tches are back for the 8th year in a row to host the best party in the 'Burgh! Akasha L. Van-Cartier will be emceeing the night with Pittsburgh Comedian & Legend, Howard Lester, so you really don't want to miss this party. Celebrate World Spay Day in style with us at Nova Place on Saturday, March 2nd. 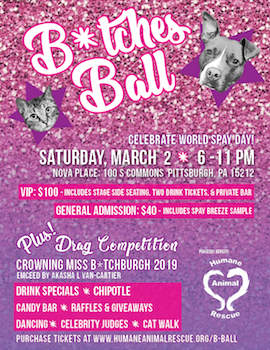 There will be drink specials, heavy hors d’oeuvres from Chipotle, a candy bar, raffles & giveaways, dancing, cat walk, and celebrity judges to crown Miss B*tchburgh. * Note: Guests under 21 are permitted to attend but will be not permitted to drink alcohol. All proceeds allow us to provide all animals the care they need, and the love they deserve. Valid for 1 VIP Admission Ticket. Valid for 2019 B*tches Ball only. Includes stage-side seating, 2 drink tickets & private bar access. Must Bring Printed Voucher to Event, this will act as your ticket to enter. Guests under 21 will not be served alcohol.